The field of project management is ever-changing, and so are the concepts and terms project managers need to learn. In this video, Jennifer Bridges, PMP, defines some newer ones for you. How many do you know off the top of your head? Some, all, none? Watch the video and see if you’re right. Take it further: If this only whets your appetite for knowledge (and it should) then you’ll want to visit The Ultimate Glossary of Project Manager Terms. 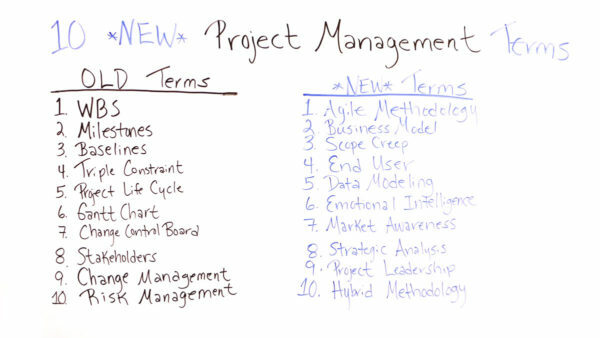 Today we’re going to review 10 new project management terms. As the field of project management continues to mature, the terms evolve also. Some of the old terms that we talked about were the WBS, the Work Breakdown Structure, milestones, baselines, the triple constraint, the project life cycle, and the Gantt chart. The change control board, stakeholders, change management, risk management. But today, companies are requiring their project managers to get a better sense of business acumen. Therefore, some of the business terms are coming to the forefront that we as project managers need to know. One is agile. Agile is a methodology that’s an alternative to project management, it’s an iterative process that allows developers to look at things incrementally. Number two is business model. Have an understanding of the business model is…the business model is how your company goes about making money. Scope creep is uncontrolled changes in your project. It’s not that scope change is a new word, but it’s becoming more and more important for project managers to keep a handle on the scope creep so it doesn’t get out of control. The end-user. We talk about end user, because more companies are more concerned these days about customer experience, the end-user, what their needs are, and how they respond to the product or service. The next term is data modeling. Data modeling looks at the data that your repository is built on, and how to structure that data so that you can know how to access it more efficiently. Emotional intelligence is taking into account people, like the people on your team, people you interact with, their emotions and how they react. Market awareness. Be more aware of the market, who your market is, who the competitors are, and how that impacts not only your business, but your pricing and your project. The strategic analysis is, again, really looking at the market and your business to see how your product or service may fit in, and what challenges it may have, according to some of the competition and market trends. The project leadership is really placing more emphasis on the people. And the hybrid methodology these days is companies realize that maybe the waterfall method or the agile method, there’s not one, so they’re beginning to combine more than one model. These are just some of the terms that we want to keep in the forefront, we want to learn more about, and incorporate into our project. If you need some more tips for your project, then sign up for our software now at ProjectManager.com.